Choosing a Student Planner - Paper or Electronic? Student planners and school planners are essential tools for students. Tracking your assignments and managing your homework is vital to doing well in school. Any type of planner that assists you in those tasks is a good thing. Most people think of student planners as something similar to a notebook. That is, something made of bound sheets of paper, with different sections to record different classes and school activities. Although the paper planner is extremely low tech, that’s not necessarily a bad thing. Paper planners are portable, fast and easy to write notes in, don’t break when dropped, and can survive just about everything, except perhaps, the family dog. One the other hand, paper planners have a number of drawbacks. Space for notes may be limited. Making changes can be difficult if an assignment date changes. And they can become difficult to read over time, with lots of cross outs and arrows pointing to updated information. The alternative to a paper planner is a school planner software program. Moving your homework schedule to the computer overcomes the biggest limitation of paper. You can’t manipulate the information written on paper the way you can manipulate data in a software program. It makes sense to use a school planner software program to manage homework. Students are always at the computer. The computer is used for taking and reviewing notes, researching, writing papers and communicating with other students. So while you’re there at the computer, you might as well use it as a student planner to keep track of your test dates and homework assignments. StudyMinder Homework System is the most popular student planner software program for Windows PCs. StudyMinder overcomes the limitations of a paper planner. View your assignments in a list view, or see them by day, week or month in a calendar format – whichever way helps you best plan ahead. See a total of unfinished assignments and the total study time required to complete them. Keep an unlimited amount of notes for each assignment. Enter your grades and automatically keep track of your current GPA. Schedule reminders that popup to let you know of important upcoming activities. 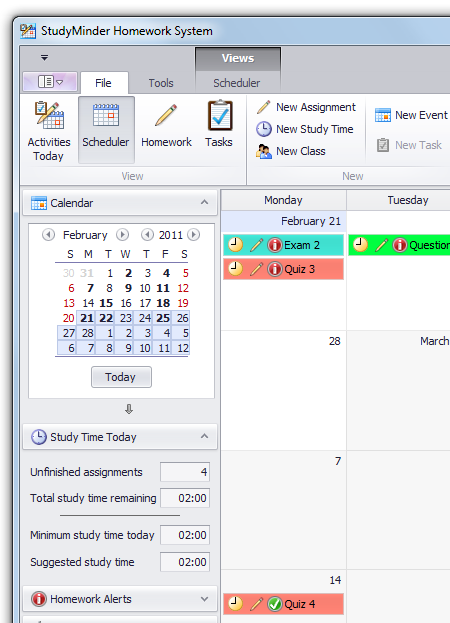 StudyMinder is different from general purpose calendar software. It is designed specifically for students. 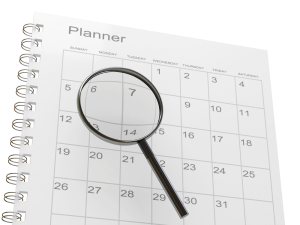 In a typical calendar program you can record the date and time that an assignment is due. An office worker can do the same kind of thing with the same program, such as record when a meeting is scheduled. But the difference between office workers and students is that an assignment due date is a target date that requires preparation that must be done before that date. Just knowing an assignment is due on Friday doesn’t help you plan when you will complete the assignment. When home assignments and tests are entered into StudyMinder, there is a place to set how much study time is required for each one. Then you use the calendar feature to schedule time to study. StudyMinder will then alert you if you have not scheduled enough study time to finish all your assignments. StudyMinder has additional features that show how much study time is required to be done today to keep up with scheduled assignments. StudyMinder also indicates critical information such as late assignments or unfinished assignments that are due tomorrow. The program is easy to use and no cost to try. You can download StudyMinder here and use it free for 30 days. And if you have any questions about how to use it, there is a series of tutorials you can watch to learn about the various features. So try out StudyMinder and compare it to your paper school planner. Decide for yourself which is better.